A nightly build of Zest 2 can be installed from our [https://hudson.eclipse.org/hudson/job/gef-zest-nightly/lastSuccessfulBuild/artifact/targetPlatform/ p2 repository]. Integration builds can be installed from the [http://marketplace.eclipse.org/content/zest Eclipse Marketplace]. The ''IConnectionStyleProvider'' and ''IEntityConnectionStyleProvider'' interfaces now contain ''getRouter'' methods returning an ''org.eclipse.draw2d.ConnectionRouter''. Return ''null'' for the default router. 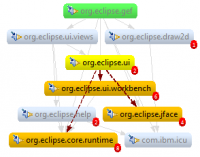 See [http://git.eclipse.org/c/gef/org.eclipse.zest.git/tree/org.eclipse.zest.examples/src/org/eclipse/zest/examples/jface/ManhattanLayoutJFaceSnippet.java ManhattanLayoutJFaceSnippet.java] in the examples bundle. A nightly build of Zest 2 can be installed from our p2 repository. Integration builds can be installed from the Eclipse Marketplace.